Picture yourself cruising down an open sand bank, the desert sun reflecting off the glass of your helmet's visor. The wind whips pleasantly against your face as your speedy travel kicks up the typically undisturbed sand behind you. The air smells fresh and outside of the roar of an engine and your own excitement filled screams, you're engulfed in the silence of a wasteland. In the distance is nothing more than a vast expanse of sandy terrain, maybe the slightest sparkle of a bustling city hits your eyes on the horizon. What you're experiencing is freedom, liberation from the everyday routine and the monotony of life. Sound nice? 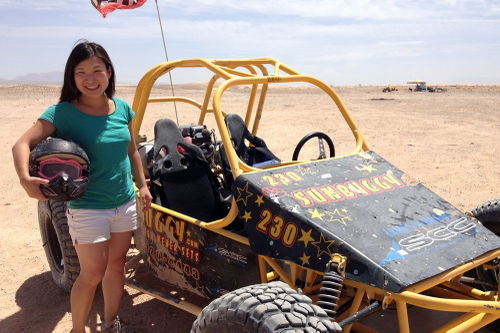 Than you need to rent yourself a dune buggy and take to the Las Vegas desert. With Lake Mead a reasonable distance away from Las Vegas, your mind may immediately default to renting a Jet Ski or speed boat and spending a nice day on the large lake. Sure, the thought of the cool water splashing against your face as you race over boaters wake may seem like the perfect experience, but as immense as Lake Mead is, sometimes the plethora of tourists can overtake its big space. If you need freedom from the big city of Las Vegas, from continuously bumping into people as you try to make it from one end of the strip to the next, a trip on the open desert is the perfect answer. Most dune buggy rental locations offer two different types of experiences - a solo tour where you take to the desert sands alone, or on a carefree ride as a passenger. An internet search for "dune buggy rentals" will bring up numerous results, so you'll want to break it down to one site that offers the best experience for the price. Sites like Bachelor Vegas and Sun Buggy offer three different unguided tours, two of which offering six passenger buggies. While each tour is filled to the brim with scenery, they differ in their overall experiences. The Valley of Fire tour acts as a leisurely stroll, allowing only a max speed of 20mph. The Mini Baja Chase, which can accommodate up to only four people, is an exhilarating chase through the desert sands and should be experience by any thrill-seeking daredevils. If you want the ability to switch between fast paced and leisurely, the Las Vegas Dune tour acts as the perfect middleman. If you're new to the dune buggy experience, it's always recommended to start off with either the slower paced tour or as a passenger on one of the guided tours. At the heart of it all, no matter what kind of experience you end up taking, you'll experience what feels like complete liberation from the mundane that is the typical work week. Whether you're strolling through the Valley of Fire or hitting top speeds as you bounce over the dunes of Las Vegas, you won't regret keeping away from that crowded lake.